Diana Tholoor, a Movement and Theatre trainer and Director of Plays recently worked with a cast of 50 children and young adults on the autism spectrum to mount a production of Jungle Book on stage. She shares her perspective in the second part of this interview series. 1. Why theatre? How does theatre help children and adults on the autism spectrum? Theatre is an integrated art form that produces simultaneous results through a single production. Amongst the many alternate forms of therapy available today, theatre produces a totality of results in the children – speech improvement, following of direction and instructions, immediate responses to change (even I do this on the mainstage rehearsal), mobility and flexibity of movement, improved comprehension, decreased or ‘no’ reaction to loud sounds, bright lights, dark spaces, increased memory capacity and responses. Confidence building, supporting one another (I am talking about the kids), enhanced social interactions and skills, Discipline and Co-ordination. Every assignment that I have taken on has always been with a goal towards producing a script on stage. This goal that will refine the learning into a level of excellence, instil and produce the results already mentioned in my response to the question above. This is to name, but, a few. Every one of these has had a minimum of 4-6 months training with the production on Main Stage. Jungle book saw the children using ropes and ladders, greater number of lighting changes, more smoke and haze, more interaction on the stage, more dancing, singing, and script lines especially for those who have never spoken on stage before, extremely disciplined movement choreography, sharper entrances and exits, split second changes. I am answering this from the perspective being Hands-on in the process of instructing, training and developing techniques to enable the children to perform. Almost 70% of the children have already been a part of Lion King and Aladdin. These children have already undergone exposure and training to stage work and all that this entails. One is unable to ascertain the mood the child will come to school in. Depending on the mood, we could be dealing with Resistance or Stubbornness in the rehearsal. Non-compliance at that point in time is one of the things we deal with. Sometimes, when the mood is on the more aggressive side, there could be a melt-down and, that requires teacher intervention in a more defined manner. The last resort would be to ask Sarbani to talk to them. The balance 30% are the smaller children who would have enrolled in the last academic year or more recently. 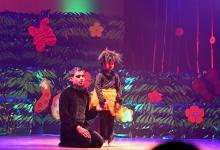 Getting the children to become disciplined on stage is a challenge. For these children, I start with movement work and use music and sound to build focus, concentration and discipline. Blocking the stage, moving towards a focussed point, staying still on stage, and getting them accustomed to loud sounds and other disctractions. To watch the boy who acted as Bhageera climb up and down the rope ladder, to watch the video of the girl who has an amazing singing voice perform on the video for the first time, to see all the children sit silently and patiently for nearly 20 minutes while the speeches were going on, to hear every word come out so audibly, to hear the audience catch the funny lines and laugh aloud. I am unable to measure which moment was ‘wow’. For me, every accomplishment is ‘wow’. Diana Tholoor founded the Chrysallis Performance Arts Centre for the Challenged on 14th February 1999. She has worked with over 1,00,000 children with and without challenges integrating them in various programmes and on stage through inspirational scripts across India and Asia. She has done ground-breaking work in Theatre for Children with Autism and is accredited with many firsts on the Platform of Integration and Awareness for people with disabilitie in Bangalore. She is a Movement, Dance and Drama Therapist who works through Movement, Dance, Drama for children and adults with physical, mental and social challenges. "It Is Possible For Children With Autism To Perform Theatre On Stage"
Autistic people are cold and feel no empathy: Myth or Fact?